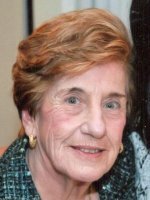 ALBANY – Louise Pellegrino, 80, of Albany, passed away Wednesday, May 11, 2016 in the Hospice Inn at St. Peter’s Hospital. Louise was born in Schenectady, the daughter of the late Joseph DiGesare and Sadie Gerardi DiGesare. She was a graduate of Mont Pleasant High School, Class of 1953, and upon her marriage in 1957 she moved to Albany where she lived the rest of her life. She was employed by the New York State Dept. of Taxation & Finance. She also was a communicant of All Saints Catholic Church and the former St. Margaret Mary’s Church, where she was a member of the church seniors group. She enjoyed traveling, especially to the Aruba Beach Club and to Atlantic City. Louise was a founding member of the Italian American Community Center. She also enjoyed bowling and bocci, knitting and crocheting. Louise was a wonderful cook and baker, and was devoted to her family. Louise was predeceased by her husband Carmelo “Carmen” Pellegrino. She is survived by her children Robert Pellegrino (Susan Elizabeth) of Westford, MA, and Linda Mastrianni (Jerome) of Guilderland; her grandchildren Samantha Linda Pellegrino, Alyssa Louise Mastrianni, and Nicholas Carmen Mastrianni; and by several nieces and nephews. She was predeceased by her sister Theresa Costanza, and her brother Dominick DiGesare. The family would like to thank the medical staff and especially the nurses of St. Peter’s Hospital and the Hospice Inn for the excellent care they provided to Louise during her stay. Funeral services will be held in the Hans Funeral Home, 1088 Western Ave., Albany, Monday morning at 8:15 am, and from there to All Saints Catholic Church, 16 Homestead St. (behind CVS), at 9:00 am. Relatives and friends are invited, and may call at the funeral home Sunday from 4 to 7 pm. Entombment will be in St. Agnes Cemetery, Menands. The family suggests memorial contributions to All Saints Catholic Church, 12 Rosemont St., Albany, NY 12203; or to The Hospice Inn, 315 S. Manning Blvd., Albany, NY 12208. To leave a message of condolence for the family or obtain directions to the funeral home, please visit www.HansFuneralHome.com. Bob and Linda you are in our prayers at this time and always. Always keep the memories you shared with your mother. She will be missed. Bobbie and Linda…I remember all of the good times we had growing up and spending time at your Glynn house with our Aunt Louise and Uncle Carmen. Those will be the memories I will cherish. Our thoughts and prayers are with you and your families. So sorry to hear about your mom’s passing, she was a beautiful lady. We’ll always have fond memories of her & your dad having fun times at the Beach Club as neighbors. May all the good memories you have of them help to get you through this difficult time now and forever.